We appreciate your input here at Deckstainhelp.com as we continue to be your go-to source for the latest in deck restoration news and trending topics through 2019. See below for an article about How to Stain Deck Spindles. How to stain deck spindles and balusters. 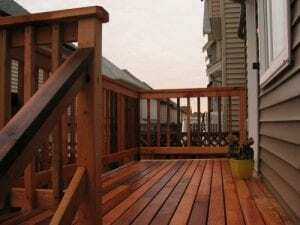 Staining deck spindles and railings require a detail-oriented mindset. Although staining deck spindles are considered more difficult than staining the floor, we have some tips that will make this step go smoothly for a flawless, even stain application. First, clean the deck spindles. Wash the railings with a spray nozzle attached to a garden hose to remove dirt and debris. If there are any stains, mild detergent mixed with water should remove them. If there is mildew, use oxygenated bleach. Rinse well with water. Let the wood dry for 2-3 days after the prep before apply the deck stain. over the stain with a stain pad to push the stain into the wood for deeper penetration and an even appearance. After staining your deck spindles, you can begin staining the floor if applicable. If you have any questions, thoughts, or comments about how to stain deck spindles or railings, we want to hear your thoughts. We are here to help! Leave a comment with pictures below.